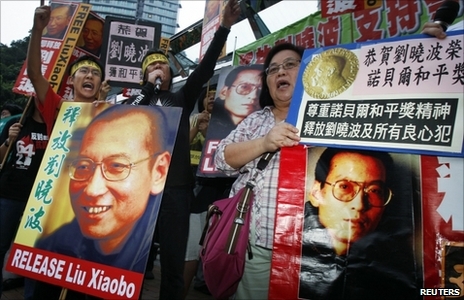 International eyes are on China and its human rights record again with the freedom fighter, Liu Xiaobo, winning the Nobel Peace Prize. Chinese authorities have spat on the award, describing it as an obscenity. And this is the country Voreqe Bainimarama wants Fiji to snuggle up to. Read further and be inspired by the acts of resistance - worldwide - that are helping to destroy these illegal, corrupt and ruthless regimes. The BBC-The awarding of the Nobel Peace Prize to the Chinese dissident, Liu Xiaobo, is a reminder of the damage autocracies do to themselves when they clamp down on freedom of speech and thought. At a single day's trial last December, Mr Liu was sentenced to 11 years in prison after having helped to draft Charter 08, a manifesto for political change in China. But the world has recognised Mr Liu and his sefless acts. His Nobel prize comes at the precise moment when people right at the top of the Chinese system such as the Premier, Wen Jiabao, are joining the debate about the need for greater political liberalisation. The act of official irritability which took away Mr Liu's freedom is becoming more and more of an international embarrassment to China. Now, in every country in the world, his name and cause will be known; and more people in dictatorships everywhere will be emboldened to imitate his small act of resistance. That last phrase comes from the book Small Acts of Resistance: How Courage, Tenacity, and Ingenuity Can Change the World. It is written by Steve Crawshaw, international advocacy director of Amnesty International, and John Jackson, a long-term campaigner for human rights and other major international issues. Suitably enough, the foreword is provided by Vaclav Havel, who helped to draft Charter 77 in the days when the hand of the Soviet Union was heavy on the former Czechoslovakia. Only 12 years later, after serving many of them in prison, Mr Havel led the entirely peaceful revolution which brought down Marxism-Leninism in the country, and became the freely-elected president. Mr Crawshaw and Mr Jackson detail example after example of the way in which governments which deny people their freedom have been brought down by people who are determined to speak and act as though they are free. "I'm full of humour and irony, and you're beating me, arresting me," declared Srdja Popovic, a Belgrade student involved in the Otpor (Resistance) movement against the late Serbian dictator, Slobodan Milosevic. "That's a game you always lose." He was right. Milosevic was soon chased out of power and put on trial for his crimes. Even in countries where it is still dangerous to speak out, people find ways of doing so. Images of Neda Agha-Soltan's dying moments shown around the world. 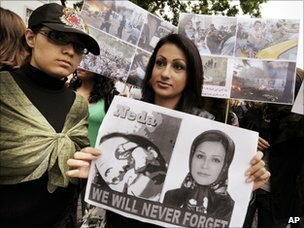 In Tehran in June 2009, a 26-year-old woman, Neda Agha-Soltan, was shot dead in the street as she took part in a protest against the strongly disputed re-election of President Mahmoud Ahmadinejad. Her dying moments were captured on video and shown around the world. Her mother had tried to talk her into staying at home, but Agha-Soltan answered: "If I don't go out, who will?" She has become a continuing symbol of resistance in a country where the government is clearly unable to win the wholehearted support of its people. But not all small acts of resistance are directed at brutal autocracies. Even in countries where the rule of law is strong, governments sometimes behave in ways that are questionable.Just before the start of Ms Gun's trial the prosecution's case collapse. Mr Crawshaw and Mr Jackson quote the case of Katharine Gun, a young translator of Chinese at the UK's Government Communications Headquarters (GCHQ), where phone calls and messages around the world are monitored. 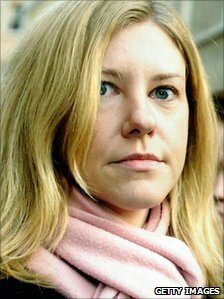 Although she had been assured by her bosses that she would never be asked to do anything illegal, a senior figure at the US National Security Agency (NSA), which works very closely with GCHQ, asked her early in 2003 to spy on governments like France, Chile and Mexico, which disapproved of the coming invasion of Iraq. Ms Gun told a friend, who told a British newspaper. She was arrested, but just before the start of her trial the prosecution case collapsed. She never got her job back, though. An American naval officer, Lt Cdr Matthew Diaz, was so shocked by the way the US authorities had refused to publish the names of those suspects detained at Guantanamo - thus preventing them from getting independent legal advice - that he copied out hundreds of names and smuggled them to a human rights organisation in New York. "Our protest will be recorded in the history books, for all generations to see”. So says Yigal Bronner, who was sentenced to six months in jail. "There was nothing else that I could really do," he said afterwards. That is how people like Vaclav Havel, Srdja Popovic, Katharine Gun and Matthew Diaz feel. Probably it is how Liu Xiaobo, the new Nobel laureate, feels. As Yigal Bronner wrote, after refusing to serve with the Israeli army in the Occupied Territories: "Our protest will be recorded in the history books, for all generations to see." In a free society, the weight of public opinion matters in such cases. In societies which are not free, people have to fight harder and risk more. But the world is full of countries which were once dictatorships and are now free and properly democratic, from Argentina to South Africa. And almost always it is small acts of resistance which have brought about the change. Not every day a hero is born so therefore we cannot asked our brothers and sisters to rise up against the only hero Fiji has ever witnessed for most are too tired of just scared given the aura that surrounds Bainimarama. Deep within their very beings they know Fiji is on the righteous path led by the only man that have the nous to return Fiji to its former glory. Most may refute what I am saying but the reality is the people on the ground are basking in the glory of their new found saviour. For a very long time the people have been made servants in their own land by rogues people with little morality. Jake, you must be mad. Voreqe is not, and never will be, a saviour. Ask yourself, what has he done for Fiji? He set out to rid Fiji of corruption etc etc, but the corruption is now exponentially grown out of proportion. Jake, are still smoking dried mushrooms? Jake is smoking suki and it makes him see things. The military govt is more corrupt but no one knows. The people in power attend dinner parties at taxpayes expense. Isnt this corruption? Unless hosts charging - 2nd last statement grey area? Stealing $200ml in cash definately isn't.